Tobins' Tastes: Zaycon Chicken Event: $1.89 a pound! If you follow my weekly shopping trip posts, you may often wonder why you don't see meat purchased. For the most part we do not eat red meat at home so the only meat I purchase for us is chicken. Justin gets his fill of other meat choices at the fire station and I personally only eat poultry. 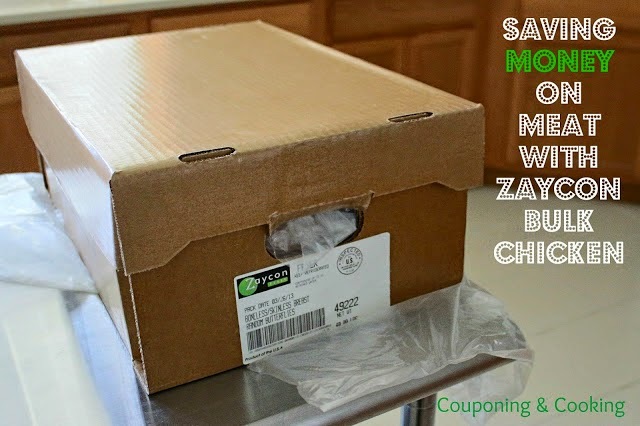 One of the big ways Justin and I save money on groceries is by purchasing our chicken in bulk from Zaycon foods. We order 40 pounds of chicken at a time and then freeze it in FoodSaver bags portioned out for future meals. It does take a bit of time to prep, portion and FoodSaver the fresh boneless, skinless chicken breasts the day they arrive but it is time well spent. Zaycon chicken is hands down the best fresh chicken we have ever bought and the price at $1.89 a pound is so much cheaper than Publix's regular price. I know that many warehouse stores may have fresh chicken around this price or a little cheaper but you cannot beat the quality. This chicken comes fresh straight from the farm and has never been frozen. Zaycon is having chicken sale events across the country in October so make sure to visit their website and see if there is sale near you. For a complete review of our past experiences with Zaycon including photos check out this past post. Check out Zaycon's website for more info on other products like their bacon, sausage, ground beef and more!